Recent research has highlighted that line management is a critical function when it comes to supporting trans employees, as Rosa Marvell explains. A study conducted in 2017 by the Institute for Employment Studies (IES) for the Advisory, Conciliation and Arbitration Service (Acas) has shown that workplaces that educate, train and support their line managers to be comfortable and confident with trans issues are more trans-inclusive. So, why is the role of line managers so important, and what actions should organisations be taking? Our study, found line manager confidence was crucial in supporting trans employees. Line managers are on the front line, dealing with numerous day-to-day issues for employees. This includes being the first port of call for many gender identity matters, including bullying, harassment, emotional support and workplace transitions. Employers and trans employees interviewed for the study explained that when someone wants to come out or transition at work, being able to talk to whoever they feel most comfortable with is very important. In many cases, this means their line manager. When trans staff trust that their line manager will be compassionate, confidential and professional, many concerns about having that conversation can be put to rest. A workplace transition can be challenging if a trans employee’s line manager is not sure how to manage the process. Interviewees emphasised that trans staff must have control over how their transition progresses. However, they should be supported by their line manager, not responsible for instructing them. Proactively ensuring that line managers are equipped with the right knowledge reduces the burden on trans staff. Line managers may also be the first to know about an incident of bullying or victimisation at work. With the right training, they can tackle negative treatment swiftly. For example, if a trans member of staff is persistently misgendered, a qualified line manager would understand how harmful this may be and could challenge unacceptable behaviour in a timely fashion. Not only does this ensure that organisational behaviour is compliant with the Equality Act, it also demonstrates a supportive organisational culture with zero tolerance for transphobia. Line managers who are experienced may, ultimately, prevent workplace conflict escalating to tribunal. This confidence is also necessary to allow line managers to deal with normal performance-related issues for trans employees. More confident line managers are better-equipped to take action as they would with any other underperforming member of staff, as they can feel more assured that their behaviour is not at risk of being discriminatory. Beyond line manager confidence, then, what is the biggest barrier to workplace trans inclusion? Despite being an invaluable mechanism to promote workplace trans equality, line management in UK businesses faces acute and pressing challenges. Published research and guidance has frequently demonstrated that a persistent and pervasive misunderstanding amongst general managers, line managers and HR professionals is one of the biggest challenges facing trans people at work. There are particular gaps in knowledge, namely what it really means to be trans, in particular being non-binary, and what good practice looks like. When line managers are not familiar with talking about trans issues, this can have a clear negative impact on the experience of trans employees. Trans staff can find themselves in uncomfortable or upsetting situations without appropriate support. Crucially, a lack of understanding means line managers are less able to deal with difficulties, less able to support trans staff and less able to challenge persistent stigma, ignorance, aggression and intentional or unintentional hurtful comments at work. Good practice employers highlighted a number of ways to build the capability of their line managers to better support trans staff. Many distributed articles to staff, held LGBT+ panel discussions with a specific focus on trans issues, had conversations about how to be more inclusive, held senior staff away days, put posters on community boards and organised Pride marches. However, two of the most prominent strategies were devising inclusive organisational policies and providing training. Written policies that make specific reference to trans staff can cement a positive organisational stance. They also provide line managers with an agreed framework that sets out expectations and guides their actions and behaviours. This can ensure cisgender managers and staff who are not so familiar with trans issues are able to have conversations with confidence and have a resource they can refer to. Interviewed employers agreed that best practice policies covered all trans staff (for example, including non-binary staff), not just those that would be explicitly protected under the Equality Act. 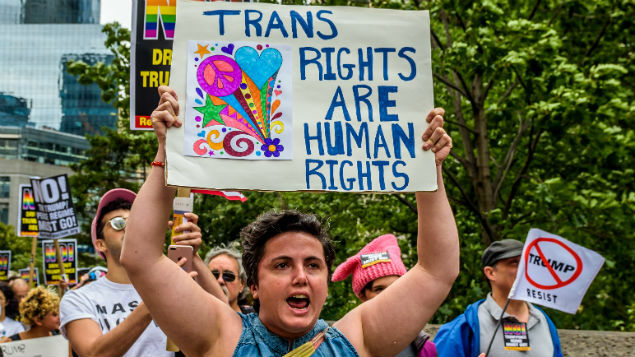 Specific mention of trans identities were included in a range of policy areas including diversity and inclusion, bullying, harassment or victimisation, parental leave or adoption and special leave. However, the most common area for trans-specific policies were to help guide a workplace transition (ie how to support a colleague who wants to change their gender presentation in the workplace). allocation of responsibilities or stages to line managers, HR or trans employees. Critically, policies related to transition should give line managers enough guidance whilst not being prescriptive. Each trans journey can look very different from another. All interviewees emphasised that policies should therefore be applied flexibly, where each stage is collectively agreed with the trans employee in question, so that the transition is the one that is right for them. Trans-inclusive training (both formal and informal) was often one of the most highly-praised activities to help organisations become more trans-inclusive. Interviewees explained that less-familiar organisations can gain a lot of insight and improve practice from high-quality diversity and inclusion training and information from expert third parties, free online resources from trusted sources and guidance from not-for-profit organisations. Training was found to be particularly high-quality when it centred on lived experience of trans employees and included resources and signposting to be used in future. Interviewees explained that trans-aware training improved individual line management interactions: line managers were better-equipped to deal professionally, sensitively and empathically with any issues that arose. In addition, employers noted that investing in such training fostered a more inclusive culture across the workforce. external general training eg using appropriate language, managing diverse teams, avoiding unconscious bias. Training often made use of ready-to-go toolkits comprising guidance, videos, scenarios and policies that line managers could work through. To maximise the impact of training, some organisations found that it was particularly effective to provide general information and guidance throughout the workforce, but target in-depth training on line managers responsible for trans staff. To ensure that knowledge was not isolated to a few individuals, some companies required trained staff to subsequently cascade what they had learned to a wider group. This also created an internal ‘training package’ which could be deployed in future, reducing the risk of line managers conducting their own personal research with dubious sources, something of much concern to trans employees, as a private employer highlighted in the study. “We need to empower our line managers to help to support our colleagues, and at the same time we need to gain sensitivity among our line managers over something they may not have come across before,” it said. A research report and a terminology guide for employers are both publicly available alongside Acas’ guidance.